Time is Running Out! 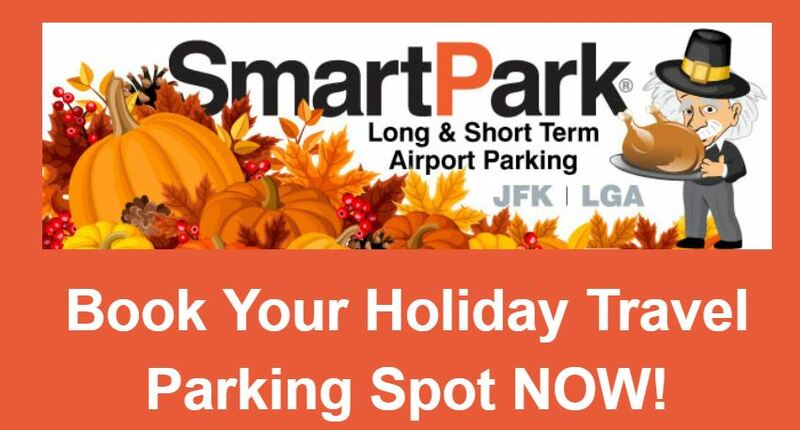 Remember to book your holiday travel EARLY with SmartPark JFK & LGA, so you don’t get shut out from your perfect holiday plans. We hate to turn people away when we fill up – but first come, first served! So, why wait? Reserve your spot today and eliminate the worry and stress of being left in the cold! By booking direct here on this website, you guarantee more exclusive benefits, can earn free days and get greater savings with no hidden fees! Become a member of our rewards program, and you will earn one point for every paid day you park with SmartPark. Then you can redeem those points to qualify for free future stays. Each paid day earns 1 point, and with 7 points, you can redeem for a free day on your next visit – or bank them for later. SmartPark’s JFK and LGA locations are mere MOMENTS from the terminals via our shuttle. Plus, our guests have peace of mind with LESS STRESS and LESS HASSLE than dealing with public airport parking lots. Oh, and did we mention, our rates are actually LOWER than those public lots too? Make “The Intelligent Choice” and start your holiday savings now! What are you waiting for? Click into our reservation system and be on your way! No credit card required as you pay when you pick up your vehicle upon checkout. Parking at SmartPark is as Easy as 1-2-3!